From this lovely guy called James Jin, who sent me an email about Broadway Donation a few months ago. We started working on that and I’ve been just hearing about it through you. My dad was actually­­-never professionally-­­but he was a dancer. It’s funny because his dad didn’t really approve of him dancing. He never took dance growing up or anything, but he just loved all of the old MGM movies and loved just trying to emulate the people that he saw on the big screen and was self-taught. Then he left his home, and he started taking dance classes here and there. When he was in his early 20’s, he started putting together nightclub acts - ­­because this was still the time when they still had variety acts at nightclubs. I wish I had some of his old pictures with me to show you. They’re amazing. He was a banker by day and then would go do his dance acts on the weekends. He was never making a living doing it, but he loved it. He would go and perform on the weekends in Buffalo, Cleveland, and Erie­-area, near where I am from. My dad has had this group­­ - they’re no longer together­­ - but he had this group called Don and the Donnettes. It was my dad and six to ten grandmothers. They were all in their 60’s and above. They were together for about 20 years or something like that. Maybe longer. When I was in second grade, they performed for senior citizen’s homes and things like that just around the community. My dad taught me a little soft shoe to Me and My Shadow. I was his little shadow. That was my first real performance. I actually never took a dance class until my senior year in high school. But my dad taught me little things. He was never really a trained dancer. But I loved watching him. When I was a kid, that’s where I totally got my joy and love of dance-­­watching my dad perform for these senior citizens. I still have a place in my heart for performing for senior citizens when people complain about not wanting to perform for the gray hairs at matinees. They may be quiet, but nobody’s having a better time than them. I grew up in the country. It was like a half hour drive to get into Erie. I started young with my dad, but that was just for recreation, for fun. Even in second grade, I had talent for it­­ - just never had any training. In junior high, I started doing shows at the Erie Playhouse, which is the community theatre in Erie. So I got a lot of dance experience through that. I never took a class until 12th grade, and then I took ballet with a friend of mine for a few months before I went to school for musical theatre. That’s when I started really training and realizing how little I knew. I didn’t really know that it was an option when I was growing up. I grew up in the country, and I never imagined that [you could make a career from theatre or dance.] Before 9th grade, it never even entered my mind. But then I started doing shows at the Erie Playhouse. For a community theatre, it’s quite good. There’s a ton of people there who end up going on and having careers and come to New York. I have friends that are still here from the playhouse. I still didn’t think about it as a real possibility until I was doing community theatre. I got really into it. I love musicals. I absolutely love them. I was doing shows all the time. Non­stop. I was doing performances and show­ choirs, musicals and all that. I think I was talking to my sister on the phone when I was like 11th grade or so. She was like “What do you want to do?” I was saying all these careers that I don’t even remember what they were. She was like “What about performing?” And I was like, “I can’t make a living doing that.” I really didn’t think that was possible. I think I just had small town mentality. I didn’t picture myself - ­­the idea of moving to New York then would’ve been the scariest thing. I grew up in the country where the grocery store was back of someone’s house, and we don’t have traffic lights to this day. Moving to a city was so foreign. Luckily, [after] that talk [with my sister], I was like, “Why don’t I do that?” Then I started looking into musical theatre schools, and I applied to a few and got into Otterbein college, and I went there. It was basically my college that made me realize that I could actually go on and do this and actually make a living and perform. Every spring, I would go strawhat auditions [in New York City.] And every year after that, I booked jobs in summer stocks around the country. How did you decide to move to New York? It just made sense. By the time I graduated, I knew more people in New York than anywhere else in the world at that point, because I had met so many people doing summer stocks. [With summer stocks,] you meet like 100 people and then they all come to New York. I feel very lucky. It’s such a different experience than some people who move here without knowing anybody or anything. I had all my closest friends here. It makes for a different experience. I am lucky to have those summer stock experiences too. Confidence wise, I was performing with Broadway people in those summer stocks, and I was like, “Oh, I can do this.” If I hadn’t done that, I don’t know that I would’ve come to New York with the same confidence and spirit. When did you end up moving to New York? Basically right after my senior year of college then. I had a couple gigs lined up after­­ summer stock jobs and then another job over the holidays and then I moved here the following January. Pretty easy. I moved in with my best friend right away. All of my friends were here. Also at that point, I had been here. I’d come and audition in the spring. Not that I knew the city. I didn’t know the city from a couple week visits from here and there. But it didn’t seem foreign or that scary. From the start, I had an amazing support system here. Just tons of friends. Everybody that I had done summer stocks with and all of my college friends. It was really easy. I don’t think I was intimidated as much as I was excited. I remember my first audition was at Chelsea studios. Because I didn’t want to be late, I went the day before to see where it was so I knew how to get there and everything. That ended quickly [laughs]. So it was just a matter of nerves as far as finding things and getting around. I had already done auditions, and they had gone well. That was a nice thing to feel moving here. What happened once you got here? I just started auditioning right away and [started working]. I was fortunate to already have connections because I had done summer stocks. I had a couple jobs out of college, and I came here and auditioned. I did a couple other regional jobs. I was non­-equity when I first moved here despite the rumors I was born with my equity card­­ - the rumors that I started [laughs]. That is one my phrases I like to say: “Honey, I was born with my equity card [laughs].” So I just started performing right away and did regional stuff, and I did a couple non­-equity tours. I got my equity card the old-­fashioned way, through the point system. Even when I was non-­equity, I was mostly working at equity houses. I remember talking to my best friend Amy on the phone. I had enough points that I could take my card. I was like, “I feel like I am ready and I should do it,” and she was like, “There’s a letter here [from equity that just arrived]. Let me open it up,” because I was out on the road, performing. She said, “It’s from equity. It says you have to take your card.” And I was just like, “Ah, okay. I guess that decides that.” But I actually feel like it was a really good way to get my card, because by the time I was equity, I had worked at so many equity houses with so many directors and choreographers who are working at those places, so I had all those connections. When I became equity, it was a fairly easy transition. I feel like a lot of people take their card so early, and they don’t have those connections, and you’re competing against people who are just as talented - ­­maybe you’re equal in talent­­ - but that director or choreographer has worked with them before, so of course, if it comes down to that, a lot of the times it goes to the person they have worked with before. I felt fortunate that was my path because I feel like it set me up for a consistent career. How long was that journey from the end of college to getting your equity card? Probably a couple years. Three years, probably, I would guess. I had a lot of points from summer stocks. Before I got my equity card, I had probably worked in six equity houses or so. I got my equity card, and I was fortunate to keep working. I did a lot of regional theatres. I did a little Off-Broadway [and some touring]. I was a mostly regional theatre boy, working at really great theatres around the country. It was good. I felt lucky to be performing. I didn’t really have to have that many sides jobs. I was pretty fortunate. Though I probably should have [taken side jobs], I just didn’t like them. Doing as many regional jobs that I did, it was a rollercoaster. I would book a job, and it would be like a month, six weeks, or three months. It was great - ­­I’d sublet my place and go do a show, have a really great time, save some money, then I’d come back, spend that money trying to get my next job. There was a period where I waited tables for 4 to ­5 months in the beginning, right after I got my card. Your energy just isn’t going to the right place. I was lucky enough before I got that job, to be established enough in the career to know that I was going to get a performing job, and I needed to keep auditioning and keep getting up everyday, training and doing all those things. But sometimes I could see how people move to the city, and they get waiting jobs because they have to, and they see all those people just going out and having fun every night - ­­not that I didn’t have fun - ­­but I could see how people could get sucked into that. When did you start making the transition from being a performer to being a choreographer and running a production company? It was a gradual transition. I still feel like I am just going to be continuously evolving. I don’t feel like I am necessarily 100% done with performing. I am just following the clues. I stopped full-­time auditioning and performing probably 4­ to 5 years ago. It started really when I helped to start a theatre company called Transcendence Theatre Company years ago. It’s an awesome company, actually thriving now. Amazing people, some of my closest friends from my world, are still doing that today. But the first project that we did was called Transcendence Artist Project, and it was in Punta Banda, Mexico. These old ladies gave us a free theatre to do this project down there. It was an awesome thing. I won’t get into all the details. That was the first time I took about five months helping to prepare for all of that. We had about 10 artists that came down. We had somebody drop out of a Broadway show to be a part of this awesome experience. And then the project was about four months or so. [Helping to set up that company] was the first time I had done something besides performing. They went on to do other things, but I felt like I wasn’t done with being here in New York and performing. So I came back here. The thing that started my production company was: I was the man of honor at my best friend Amy’s wedding. This was before I knew what a flashmob was­­ - before flashmob was a common term at all. I had to give a speech at the reception. I did a surprise musical theatre toast to her. It started with me singing and then all of our closest friends popping up and singing and then her new father­-in-­law singing and her brothers shouting a line because they don’t sing. It took off on YouTube like crazy. It’s got like a few million views. I was working with a theatre agent at the time with performing, and I sent her the video as kind of a reminder to keep submitting me [laughs]. And she was like, “I have this niece who does public relations. I should set you up with her.” I didn’t think anything would come from it, but sure enough, a week or so later, she called me, and I did this project for her for the national jewish outreach program to “I Gotta Feeling”­­but it was that “Shabbat’s gonna be a good night.” It was total musical theatre cheese and everything, and it took off, got like 45,000 views in the first week, and they were thrilled. They were like, “We would’ve been happy with a couple hundred views.” She represented different companies, so I started putting up these music video parodies or flash mobs. It was basically through word­-of-­mouth that I started directing and choreographing all these things. After a while, I had enough of a body of work, so I was like, “I am just going to name the company and put up a website, and pretend that it’s a company [laughs].” So I did that. At that point, I was juggling a lot of things. I was still performing during that time. Unique New York [Mike’s production company] became just another avenue. It wasn’t full­-time when it first started. I was doing couple projects like that a few times a year, and then I was performing still, and then I started directing and choreographing a little bit of theatre. I like [working on Unique New York] a lot, and it’s shockingly fulfilling. It’s working for corporate companies, so you think it’s going to be very corporate, but they don’t know what they want a lot of time. So it’s a blank canvas, which is exciting. In a lot of ways, it’s more fulfilling to me creatively than performing, because in a show, you always have to fit into a type and then into a role, and then into a voice-­type, and you have to sing in a certain way, act a certain way. There are certain expectations, where as I get to use all of my creative skills and think outside of the box. As a choreographer, it helped me open my mind up because I do a lot of video work. There are no walls. You can cut and do special effects and all sorts of things. It’s gotten me outside of the dimensions of the stage / box. How did Broadway Donation come about? I had that idea in my head for years. Probably five or six years before I did it. I think I was inspired originally from Yoga To The People, which is a donation­ based yoga studio. I had taken there when I first moved to the city. Somehow I made the connection, “Why don’t we do this for dance?” So I looked it up because there’s this thing: if you have an idea, there’s probably somebody else having that same idea somewhere else in the world at the same time. I’ve learned when you come up with ideas, you should look them up to see if anybody else has already done it. There was a company. 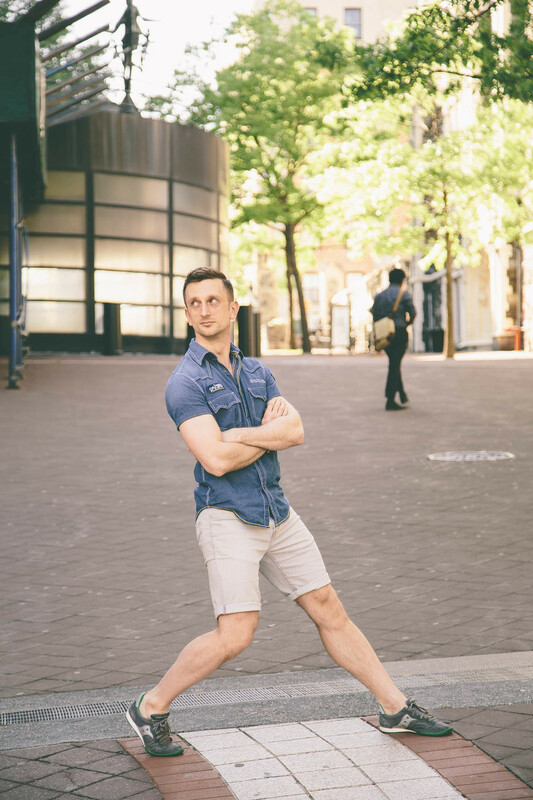 It seemed more like, “Everybody come and dance­­ you don’t have to be a professional.” My idea from the start was that I want this for professional musical theatre artists. It’s one of my favorite things that I am doing by far for so many different reasons. One reason is that I feel like I am trying to end the story, which is my story. When I first moved to the city, somehow my closest friends all happened to have money either through their parents, or inheritances, or different things. I had a different story than they had. I didn’t make excuses. I wasn’t one of those people who say I can’t afford to train; I can’t afford to do this. I did it. But I just saw how much easier it was for my friends who had money to be able to take the class that they wanted to take, get the headshots they wanted to get, and to be able to do all these things, and it was easier for them. I am certainly not complaining. I feel very lucky to be in the situation I was in. But also, the challenges kept pushing me in all these different directions that I don’t think I ever would’ve started Unique New York or Broadway Donation­­ - these are two of the things that I really love. I love obstacles as a creative person. I feel like it’s the universe telling you that you have to go to a different direction. Creatively, sometimes it can be your best friend. You come up with something completely different than what would’ve been the obvious choice. All of my friends had money and were able to afford to do all this, and it was definitely a different experience not having the money. My whole goal with Broadway Donation is to end that story. If you want to train, you can train. Our whole mission is to level the playing field so that any artist who wants to train can train. People use the excuse of “I can’t afford to take class” a lot and you can’t say that anymore. Sometimes I joke with my friends­­ and say that I just started so that I can take dance classes with all my friends. It’s been a community around me, which is amazing. It’s just been an awesome, awesome, journey. How do you find these teachers? A lot of them are my friends. I started this with Austin Eyer. Between the two of us, we were just very connected with years of performing in the business. I’ve known Al and Ricky for years. Austin and I also had different groups, so he brought in a group and I’ve brought in a group. We basically stuck with most of the same teachers, because we know them, and they’re great. People have been submitting to teach too. It’s hard because what we found with Broadway Donation is that people follow their teacher. They don’t come and try new teachers. If you don’t have a huge following already, then your class at Broadway Donation attendance isn’t as high, which is a shame. Some of those teachers are the best teachers we have. But we can’t have them back if they don’t have the numbers because our whole thing is based on high numbers. If we have a big group, we can afford to pay the studio and pay the teachers and keep Broadway Donation alive and growing. I want to continue to direct and choreograph and want to be doing more theatre again. Last year and a half, my production company has been creating stability so that I can go and do other things.Something that has been on my list of things to do is to make a list of things to do. And to really start to re­evaluate where I am at, and where I am going, and where I want to be going. I’ve been trying to create space to have the time to do all of the things I want to be doing and everything. Just my shimmy. It’s really good [laughs].